Kyle Gibson pitched a good game but the offense was quiet and the Twins lost by a run. Again. This team is now 3-13 in one-run games. They only lost 18 games by a one-run deficit all of last season. Gibson threw a career-high 118 pitches and only gave up two solo home runs over seven innings pitched. It’s pretty difficult to expect more from a starter in 2018. Gibson has now allowed two runs or fewer in eight of his 13 starts … and his record is 1-4. Baseball is weird. Last season, Gisbon wasn’t very good and the Twins still went 18-11 in games he started. Gibby’s been really good this year, and the team is only 6-7 when he’s on the bump. Eddie Rosario had a pair of hits (ho-hum), as did Miguel Sano. Both those guys also made some plays in the field, as Rosie nailed a runner at the plate with a nice throw and Sano made a pair of good-looking scoops at first base. The Twins had the go-ahead run on in the ninth and turned to the recently called up Jake Cave to pinch hit for Ehire Adrianza. Yes, that same Jake Cave who had nine career plate appearances coming into today. He struck out on three pitches to end the game. I'd hate to say "same story, same comment" but I'm not sure what to say anymore. Frustrating. With Detroit winning, they open a bit of a gap too. What's the record for one run losses in a season? Man they have to start hitting, or walking, or stealing bases, or doing something to get some runs across the plate. These pitchers are going to go through some cold stretches too, they aren't going to pitch like this all year it's the nature of the game, so they really really need to take advantage of all these good starts they have had. They do control what to do about it. 3-13 in 1 run games is just crazy! Make that .500 and we're right in this thing and have the potential to make a real move the rest of the way. It's just so....so....i can't even find the right word. Demote Sano to Rochester, he is not worthy if roster and service time right now.He is part of the libeup srinking. Cut LaMerre so that Molitor cannot play him. Option Pressly, Cut Morrison already, LoMo's bat is a no go. Not good wasting ant mire at bats on him. There have to be some peopke worthy of coming up that can do better in the lineup than thus. Um, okay. And who do you propose to fill all those positions if you cut them all? Sano and Morrison should bat lower in the order. Cut LaMarre, Wilson and Adrianza. Call Duffey back up. Promote Astudillo and Gordon. When Polanco comes back, cut Petit. If Garver keeps struggling, demote him and promote Wynston Sawyer. If Cave keeps struggling, Wade can be promoted. I think this is the best solution so far. Rotate Gordon, Escobar and Polanco when Polanco comes back so that Escobar could rest a bit. Perspective. Kyle Gibson has the best ERA on the starting pitching staff at 3.45. HE HAS ONE WIN! 1) It tells you how little value wins and losses have in this day and age. 2) Can we get the guy some more wins anyway? He's been really good and has nothing to show for it. Score some runs for this rotation. Even Lynn almost has his ERA under 5. With last years offense at the end of the year, I think they'd be in first and I think it wouldn't even be close. I think you can stick a fork in these guys.I am sure it is not the case but these guys seem heartless.Chicago plays hard, Detroit plays hard and we just don't.Kudos to the pitching staff, they have done a nice job the last several weeks.I expect the arms will tire a little, the bats will wake up a little, but, a little too late.Move Adrianza and maybe Polanco too and bring up Gordon.Maybe a little life will enter the squad as we get younger. I have been gone for a week guiding a trip in the Black Hills and Badlands so I am turning to TD this morning to help me catch up.I look at the lineup and see two starters above 260 - Rosario and Escobar.Overall the pitching looks good, but a two person lineup is tough to win with. So I went back through the weeks box scores and pitching looks good - except I have to ask what is happening to Pressly?Did he get burnt out?Odorizzi has his ERA growing.Romero and Berrios looked solid. 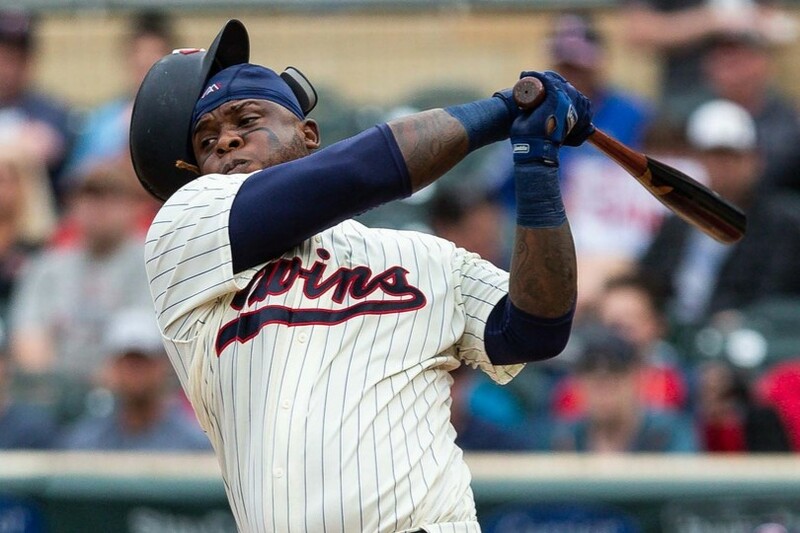 Last week I was told by one of the readers that LOMO had turned it around.His BA is still 191 and it is June.Not pleased with that.I prefer his bats go to Sano - even though his Ks still depress me.Where is Dozier.Aren't we getting close enough to half a season for him to wake up and take off again? Do we really think Adrianza is better than Gordon?Or is Adrianza like LaMarre and Cave - additions by our smart FO who have to get lots of opportunities before we can bring up our own guys - Gordon and Wade? Still not a FO fan. I will be home for a week now so I should catch up, did I miss any other important details? I was working around the house and caught only glimpses of the first few innings. I remember seeing 69(?) pitches at the end of the third. I watched from the 5th inning on. Gibson seemed to have adjusted to a good version of his old self, throwing sinkers and pitching to contact. His last nine outs were on ground balls. The in-game change allowed him to be effective through the 7th. I was impressed. Too bad the hitters couldn't find a few runs. This is how we baseball. You're right, it wouldn't be close. In the second half last year, the Twins team OPS was .803, the exact number that the Yankees are putting up this year. While we're a little limited in what we can do because we don't have great organizational depth at this point, there are a couple of things that make sense at least to me. 1. Gordon for either Petit or Cave - Gordon is tearing up AAA and we have a window to give him playing time before Polanco comes back.After that, he can give Dozier/Escobar/Polanco a day off or DH day now or then and Adrianza becomes what he should be - a little used UTL who's there mostly for injury insurance. If we find out that Gordon isn't ready he can go back and guys like Petit are generally available. Keep Cave only if h's going to be in a fight to the death for the 4th OF position with LaMarre and get a chance to play - otherwise back to AAA. 2.DL Pressley and call up Busenitz.Pressley needs a break and he's got to have a sore shoulder or elbow that could use time off. Busenitz did the job last year and has a 0.41 ERA in AAA. Use him now in the bigs before Rochester overuses him and burns him out. Yeah I know his FIP and xFIP, etc. weren't great last year but those are tools to help you find the answer, they aren't the answer by themselves. What we know is that he had a 1.99 ERA last year with the Twins in 28 appearances, and had 28 SOs in 31.2 innings. Sounds like a guy who can pitch at the MLB level and when Pressley comes back we have a hopefully better guy in the BP. 3. Scour the trade market/waiver wire for a RH DH type - doesn't matter where he plays (although OF would be nice). Trade Morrison for what you can get. He was never part of the overall strategic plan anyway, he was just a nice pickup at a good price that might help. Problem is he isn't helping much. Make Sano the everyday 1B who DHs or plays 3B when Mauer gets back. 4.Bring up Rupp to replace Wilson. Bobby is a nice story, decent but not great defender, and by all accounts a nice guy in the clubhouse. He cannot hit water if he falls out of a boat. Rupp is supposedly a decent but not great defender and he can hit a little. It's reasonable to expect Rupp to give us .230-.240/.300/.400.Wilson works if you have 8 good hitters and can live with a black hole at one spot. We can't. Alternate Rupp and Garver so Garver gets time to develop and we see if Rupp can be part of the team next year. I think those 4 things would help solve, but not actually solve the offensive porblems. The final solution (if there is one) won't come until Mauer and Polanco are back to play every day, Buxton is back with a last year's swing, and Sano remembers how to hit.These last things may come in time. If they don't, this way at least we're developing a few guys now and we can trade veteran starting pitching at the deadline to develop our own at the MLB level. I am beginning to believe the Twins are being punished for coming up with that inane slogan. Some things you just bring upon yourself. I don't know. 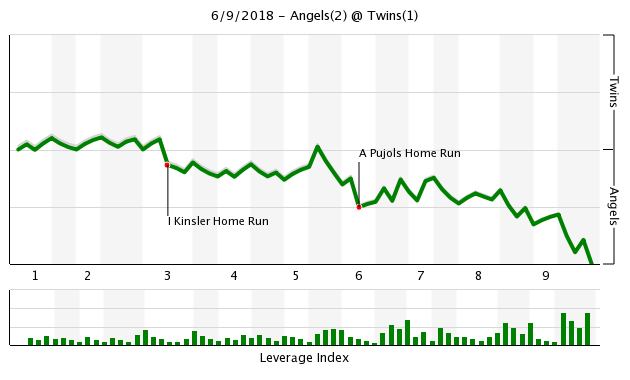 But one run losses can fluctuate a lot from year to year. It's quite conceivable that we could redo the season up to this point and have several more wins. → Article: LAA 2, MIN 1: Is This a Rerun?